- Write a story that incorporates the universe of the Mushroom Men console game, published by Gamecock Media. Entrants should read the game background information before submitting their entries. - Free writing contest entries should be between 500 and 1500 words. - Submit writing contest entries to Space Squid as an attached RTF file. Please put "Free Writing Contest: YOUR STORY TITLE" in the subject line. - Submissions will be judged according to a) How well they adhere to the game universe, and b) How much they rock. 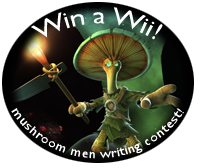 - First prize is a free Wii game console, the Mushroom Men videogame, and publication in Space Squid. - Runners up prizes TBA and publication in RevolutionSF.com. - This is a free writing contest; multiple entries encouraged. An ichorous green meteor plummets through the Earth's atmosphere, fracturing and showering the earth with glowing green space dust that affects all forms of life nearby. Some plant life -- mushrooms and cacti -- acquire sentience while, the meteor twists and mutates other life forms, transforming insects and animals into semi-intelligent, warlike communities. Some among the four Mushroom Men tribes believe that the secret to winning the Spore War lays in uncovering the facts about the Mushroom's origins. As the myth states, the Mushroom who discovers the truth of this mystery is promised the power to change the entire course of evolution, putting the Mushroom species at the top of the evolutionary ladder. The tribe that claims this prize can reshape the world any way they see fit. The Amanitas Empire and The Lepiota Order see the myth as a chance to not only defeat the other nations (the Bolete Tribe and the Morel Brotherhood) but also wipe out all of their enemies and put their tribes at the forefront of terrestrial evolution. If you are interested in submitting a story, be sure to read all the background information. You have a really great blog header. Sorry but I have about something betters to do than submit stories in writing contests. You never know of course, but how interested are people in MY stories? Well, people might be interested in your stories if you put them out there. And if you submit to a contest you might win a Wii! That's such a cool picture! Dude I want to try this! I'll definitely tell my friends about it too!